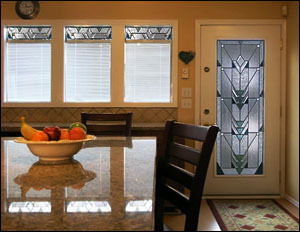 SGO Designer Glass has partnered with Medieval Glass to provide a unique line of triple glazed traditional cut glass units designed especially for the entryway and bathroom markets. 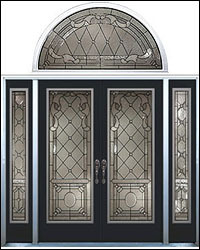 Through SGO Designer Glass, Medieval Glass offers a wide variety of Iron Art Glass™, Wrought Iron™, and Traditional Art Glass™ patterns that can be used in your existing door or window as well as a variety of finishes and colors. In translucent applications, UltraGlas® provides natural diffusion, for privacy, while permitting 100% light transmission. 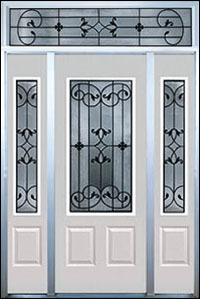 It meets codes for safety glass and requires very little maintenance. 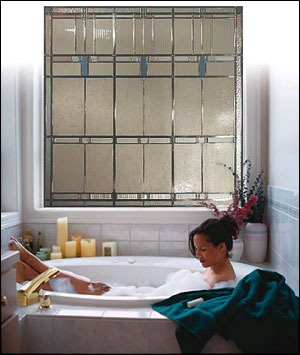 The Medieval Glass products offer a Lifetime Limited Warranty. The SGO Designer Glass experience begins in either our studio, your home or your business. During this step we try to gather as much information about your project and needs. We will sit down with you to look at numerous samples with different colors, textures and thicknesses, as well as discus all of your instillation options. If you are unsure of what it is you'd like to do, not to worry, we can help. Our design consultants have numerous tools and templates and are ready to assist you in developing your ideas. Average lead time is 4 to 6 weeks.